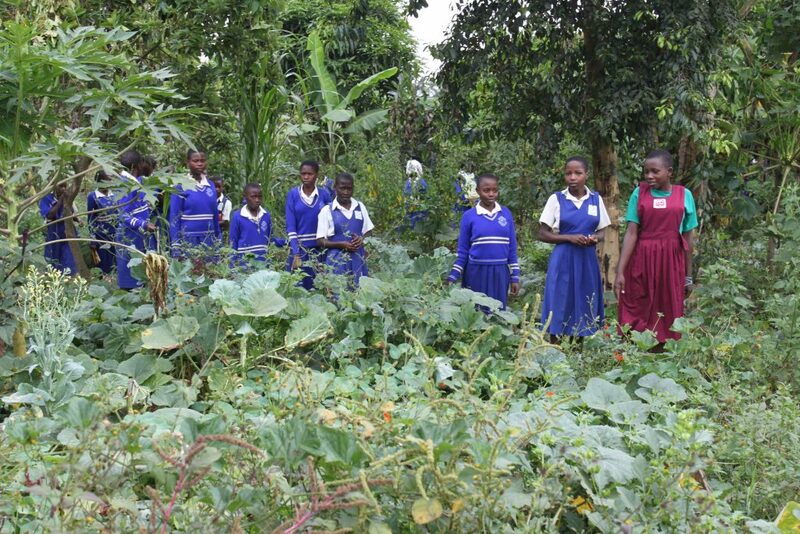 These school girls at Sabina School Uganda are in the forest garden planted back in 2010 which has since grown into a jungle of edible plants surrounding the campus. There are coffee bushes and papayas in the under-story, a ground cover of squashes and pumpkins, you can also see amaranth and herbs in the foreground as well as banana and citrus growing happily in the shade of the towering avocado trees above. Surely this is a vision of the future we must now realize we are heading for? A school garden such as this can not only provide a significant boost to the nutrition of the pupils and represents cost saving on all sorts of resources the forest can also mop up excess rainfall and soak up the nutrients from the compost and organic wastes produced by the school. a nature reserve – all at the same time. We have been using this graph on the project a lot. It maps the emissions reduction required to give our selves a chance of avoiding run away climate catastrophe and maps the transition to a low-carbon future. 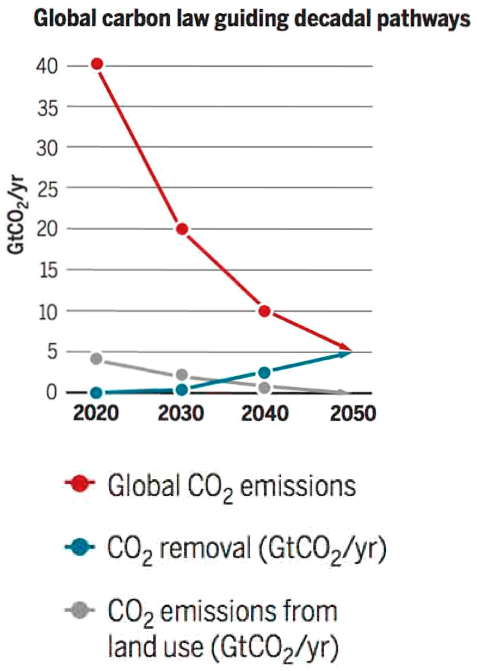 The problem with the graph is that it looks like a plunge into the unknown, Halving CO2 emissions each decade is gin to get progressively harder and demand more and more creativity from us to find ways to resolve our resource needs in new and different ways. So via this project we are inviting people to look at the future somewhat differently. We have to embrace change as an opportunity.. it is one of the core ideas in permaculture, change is inevitable and fighting against it will always fail ultimately. 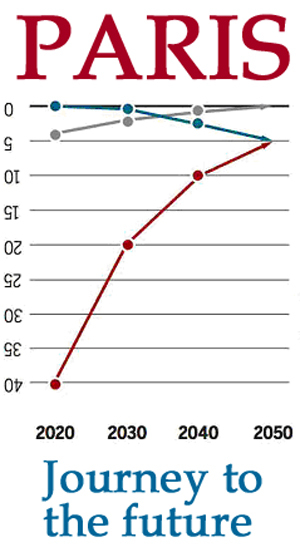 Lets us see this differently — just by flipping the graph upside down we instantly get a different picture. Rather than something diminishing into uncertainty, lets us see this as a rising out of the depths of fossil fuel addiction and pollution to a new dawn of low-carbon and increasingly sustainable world. The human project as a whole needs to begin to find ways to think and behave as a single species with a common destiny. The more I have been thinking and researching into climate change the more I have come to realise that in solving this challenge we will have to face and solve a great many other challenges at the same time. Following the Paris targets still only gives us something like a 66% chance of avoiding climate catastrophe and each new report published seems to bring ever more urgent cries for change with it. So change we must and if we can embrace this change as a transformation journey then we have the opportunity to create a much netter, fairer, interconnected and more localised society and economy in the process. I see it as a win win but however we see it we certainly need to get on with it. about how we are going to make this transition? 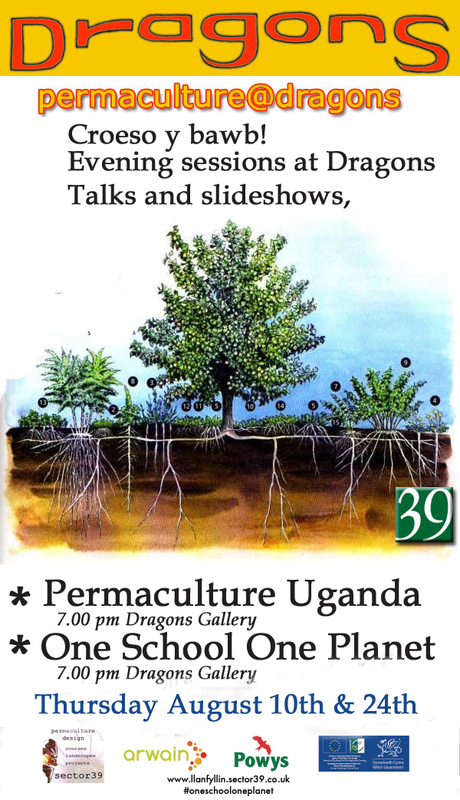 The first two of a series of evening events discussing permaculture, education and transtion at Dragons Co-op in Llanrhaeadr Ym Mochnant.